With the latest food scare upon us—peanut butter of all things!—I’d like to recommend a replacement of sorts for that much-loved, and now all-but-verboten, lunchtime staple. Farra D’Orazio, the Director of Public Relations at the hotel, was well aware of my wife’s peanut butter obsession, and had arranged for a special dessert that would play right into her every sweet-tooth tendency: Baked chocolate and peanut butter napoleon with raspberry coulis. And Scott, in a wildly successful effort to further clarify the peanut-butter-and-jelly nature of the dish, had brought along a bottle of Banfi’s Rosa Regale Brachetto d’Acqui, the sweet, perfumed, sparkling Piedmontese red that far too many people still don’t know enough about. Brachetto d’Acqui is one of those hidden gems that offers ten times more pleasure than its price or lack of familiarity would seem to indicate. 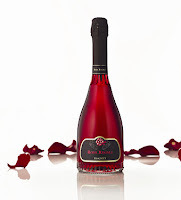 And the Rosa Regale bottling, with its rose petal and raspberry perfume, is that rare wine that’s both stimulating to the intellect and thoroughly, blissfully gulpable. My wife liked the earrings I bought her, but she loved her peanut butter and jelly dessert. Sometimes, jewelry just can’t compete with a perfect pairing. Good question--you always have to be careful pairing sweet wines with desserts. If you're not careful, it all just becomes a sugary mess. But in this case, because the napoleon was not too sweet (in fact, it had a great savory note to it), it paired beautifully with the Rosa Regale. This is yet another example of how a touch of salt in a dessert can not only enhance its own flavor, but also make it far more wine-friendly, too.